This is part seven in our series of blog posts which looks more closely at the gemstone choices in Hasso bike chain cufflinks. This blog post will be about the new aquamarine cufflinks. The post will delve into more detail about why I chose the aquamarine gemstones for these cufflinks, what I think they bring to the range, what I think works well with their light blue colour, as well as some other things like giving them as a gift and what to match them with. If you want to read more about the aquamarine gemstone, head over to read the aquamarine stone article which is linked here. Just a couple of things to get sorted before the article proper. We use created aquamarine which is a cubic zirconia. This is because it is way more consistent and more affordable in the cufflinks. Custom orders are available, so if you want a pair of cufflinks with natural aquamarine please get in contact. To get the right depth of colour, we would only recommend using very high grade aquamarines, which will add between £100 and £150 to the cufflink price. Please note, this is only a ballpark estimate to help you before you get in contact. Aquamarine is the March birthstone. It is the 19thwedding anniversary stone. If you want more information about the birthstone features and some interesting facts and stories about the stone, head over to the aquamarine March birthstone article. 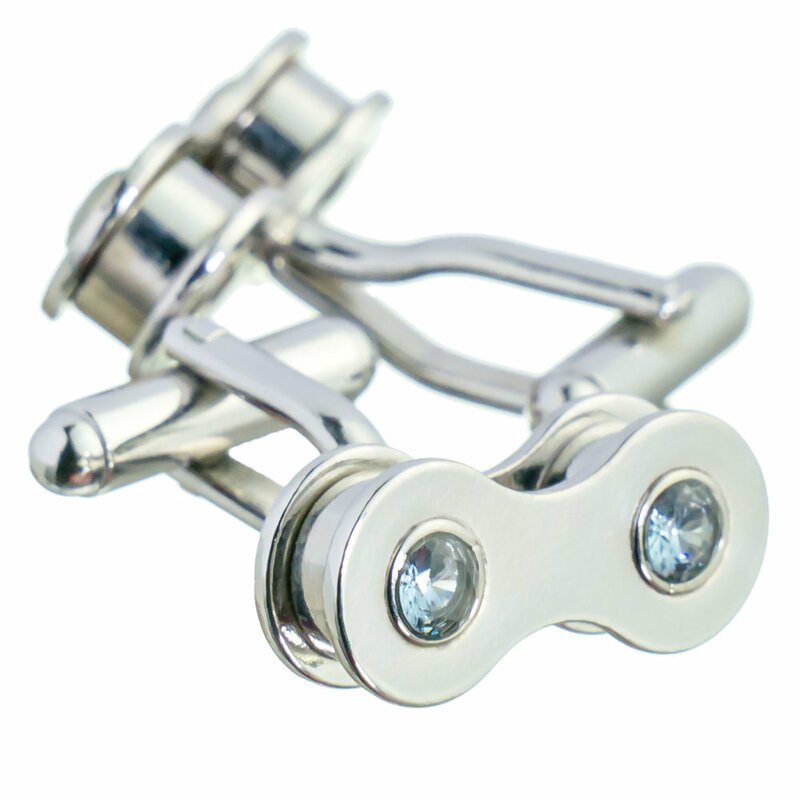 As with all of our bike chain cufflinks, the aquamarine cufflinks are made in the UK. They are genuine bike chain plated in silver, rose gold or gold and transformed into jewellery with the addition of gemstones. The cufflinks look subtle and elegant. The delicate blue colour of the aquamarine suits formal dress and understated occasions perfectly. Aquamarines are a new addition to the bike chain cufflink range, having first been exhibited in Home and Gift in Harrogate and the Moda Trade Show in Birmingham NEC in 2018. After a successful launch with stockists, the aquamarine bike chain cufflinks were released to the public shortly afterwards. The gemstone is in the same range of blues as the swiss topaz, but is more pale. It gains more of a steel colour in silver. When the aquamarine gemstone is in gold cufflinks and rose gold the blue-gold contrast looks more striking. I originally only made the cufflinks in gold and rose gold, because I felt the silver bike chain made the cufflinks look too steel-coloured, but after showing some samples to customers the silver cufflinks with aquamarine were also included. They’ve grown on me since then. Aquamarine cufflinks feel civilised and delicate to wear. The contrast of the aquamarine gemstone’s subtlety and the bold metal of the bike chain means they can work with patterned shirts, but will look their best with a white double cuff shirt.